Back on June 9th, Nickelodeon Home Entertainment and Paramount Home Media Distribution released two new Teenage Mutant Ninja Turtles DVDs, which featured DVDs feature episodes from the 2003 Teenage Mutant Ninja Turtle cartoon and that are sure to please fans of ALL ages! 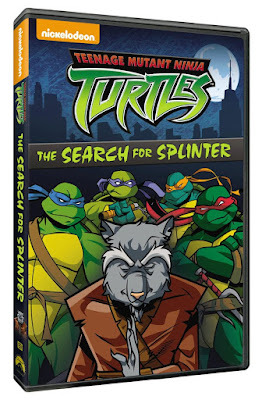 "The Turtles from the 2003 hit-animated series have re-emerged in Teenage Mutant Ninja Turtles: The Search for Splinter and Teenage Mutant Ninja Turtles: NYC Showdown, bringing some of the biggest adventures from season one of this classic series back to DVD in two exciting volumes, each offered at a great value price! Created by Nickelodeon Home Entertainment and distributed by Paramount Home Media Distribution, Teenage Mutant Ninja Turtles: The Search for Splinter and Teenage Mutant Ninja Turtles: NYC Showdown are both available on DVD June 9 for the suggested retail price of $9.99 each. Things Change–In the first episode of this series, the Turtles and Master Splinter are suddenly attacked by a horde of Mouser robots! These mechanical menaces chomp through stone, steel, and even Turtles, until the roof of the Turtle’s sewer-lair caves in, separating our heroes from their beloved Master. Now the Turtles must abandon their home of 15 years and find their missing master. On the way, they have to deal with collapsed sewer tunnels, the Purple Dragon street gang and a small army of mysterious, highly trained ninjas! The Search for Splinter, Part 1–After the frustrated Turtles exhaust their search for Splinter, their suspicions turn to the Guardians and the trail soon leads them to a non-descript building. The initials of its company name spell out “TCRI”–the same letters stamped onto the canister of ooze responsible for their mutation. Now with two reasons to infiltrate that building, the Turtles recruit both April and Casey to help get them inside. The Search for Splinter, Part 2–In this conclusion of the two-part season finale, the Turtles successfully infiltrate the mysterious TCRI building, where they manage to sneak into its inner sanctum and locate the unconsciousSplinter inside a stasis tank. They also discover that there’s more to the technicians inside than meets the eye. Return to New York, Part 1-The Turtles return to New York with one goal in mind--to destroy Shredder once andfor all. With April providing remote computer assistance from the lair, the Turtles begin their assault on the Foot Headquarters skyscraper, fighting their way to the top, floor by floor. They must overcome an army of Foot Ninja Guards and the deadly cloaking Foot Tech Ninja, but no one is quite prepared for what they encounter inside a Foot Genetics lab. Return to New York, Part 2-The Turtles and Splinter continue to fight their way up through the Foot Headquarters skyscraper, facing down three misshapen Mutant Shredder Clones, a hallway of traps and never-before-seen supernatural foes known as the Mystic Ninja. Finally, they reach their goal--the top floor and Shredder's throne room--but they must confront Shredder's deadly Foot Elite Ninja. Things really get out of hand when Stockman, in a souped-up exo-suit, crashes the party…literally. Return to New York, Part 3-With Stockman showing up in the middle of the final battle between our heroes and Shredder, everything is thrown into chaos, temporarily forcing the Turtles to team up with Shredder and Hun to defeat Stockman before he annihilates them all. Once Stockman is eliminated, the final fight continues as the Turtles face the ultimate challenge high atop Shredder’s skyscraper." My husband was so excited when he saw the Teenage Mutant Ninja Turtles: The Search for Splinter arrive on our doorstep. 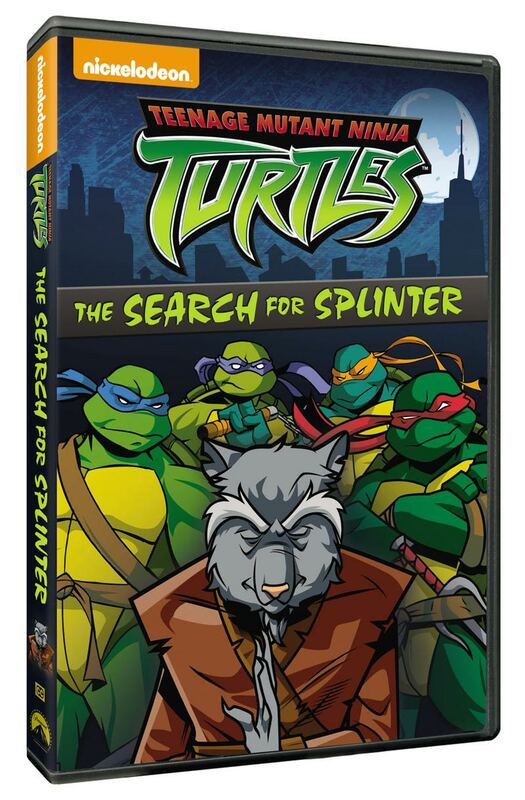 Like the girls, he was itching to watch the three already aired episodes which make up this recent release, as two of his favorite episodes from the first season of this classic series which began in 2003 were "The Search for Splinter, Part 1" and "The Search for Sprinter, Part 2". He said that this 2-part season finale was the best of the series and one he still remembers...I know as he was filling my nephew in on what was happening and all about the company, TCRI, which housed the missing Splinter. Fans of this classic cartoon series will definitely want to add this DVD and the other release, "Teenage Mutant Ninja Turtles: NYC Showdown" to their growing TMNT DVD collection. And, at only $9.99 per DVD, you can't go wrong for the price! Nickelodeon, now in its 36th year, is the number-one entertainment brand for kids. It has built a diverse, global business by putting kids first in everything it does. The company includes television programming and production in the United States and around the world, plus consumer products, online, recreation, books and feature films. Nickelodeon’s U.S. television network is seen in more than 100 million households and has been the number-one-rated basic cable network for20 consecutive years. For more information or artwork, visit http://www.nickpress.com. Nickelodeon and all related titles, characters and logos are trademarks of Viacom Inc. (NASDAQ: VIA, VIAB). My friend's little boys love these guys and this is a great price thanks for sharing I will tell my friend about this one.